Unexplained psychiatric symptoms can be a prominent feature in early sporadic Creutzfeldt-Jakob disease (sCJD), which is also common in anti-N-Methyl D-aspartate receptor (anti-NMDA-R) encephalitis. Given that the majority of the patients are initially seen by psychiatrists, it is important that all physicians (especially psychiatrists) consider sCJD and anti-NMDA-R encephalitis as possible causes of unexplained acute psychosis, and be able to differentiate sCJD and anti-NMDA-R encephalitis since the latter is treatable. In general, early diagnosis and treatment is believed to improve patient outcomes, and is critical for protecting families, physicians and nursing staffs from prion transmission during the treatment. In this paper, we retrospectively reviewed the medical records of a 58-year-old woman with an 8-month history of dementia associated with progressive psychiatric symptoms. She was diagnosed with probable sCJD based on the Centers for Disease Control and Prevention (CDC) criteria, with initial findings of memory deficit, confusion and hypoemotivity. High signal abnormalities on bilateral lenticular nucleus, caudate nucleus on diffusion-weighted MRI (DWI) and periodic triphasics in electroencephalography (EEG) were detected. Physicians should consider sporadic Creutzfeldt- Jakob disease (sCJD) and anti-N-Methyl D-aspartate receptor (anti-NMDA-R) encephalitis as possible causes of unexplained acute psychosis, and be able to differentiate sCJD and anti-NMDA-R encephalitis since the latter is treatable. Moreover, it is also critical for protecting families, physicians and nursing staffs from prion transmission during the treatment. The following case report highlights that early psychiatric symptoms play a key role in differentiating pre-mortem sCJD and anti- NMDA-R encephalitis. The patient was a 58-year-old woman with an 8-month history of dementia associated with progressive psychiatric symptoms. Her initial symptoms included memory deficit, confusion and hypoemotivity. Three months ago, on her first visit to the clinic, her daughter and husband reported that the cognitive and psychiatric problems had got rapidly worsened in the past two weeks. The patient ate less and slept more. The examination indicated that she displayed apparent signs of psychosis, including suspiciousness, visual hallucination, and too much sleep, as well as stupor state and forced gestures. Her cranial nerves were grossly normal. Her reflexes were unsymmetrical, since her Babinski reflex was positive on the left side, but negative on the right side. Myoclonic seizures were clearly present in her lower limbs. She was unable to accomplish the physical examination of sensation, coordination and gait, or to complete the Mini-Mental State Examination (MMSE) or perform other complicated tasks due to her mental disturbances. Her family denied that she had suffered any auditory or other sensory hallucinations. Her past medical history was non-contributory. She had not undergone any previous surgical procedures, with no hypertension, diabetes or coronary heart disease history, and there was no family history of psychosis, dementia or prion disease. She did not have any known allergies, and her medications were consisted in naturopathic remedies and started at the onset of her symptoms. She had never travelled to other places, and had no exposure to raw livestock. Laboratory assays including blood routine, urine routine, liver studies, kidney studies, blood electrolytes, vitamin B1, vitamin B12 and folate levels, lactic acid, erythrocyte sedimentation rate (ESR), human immune-deficiency virus (HIV) tests were carried out, and all results stayed within normal ranges. However, her thyroid values were abnormal: TG-Ab 136.8900IU/mL, TPO-Ab 0.4900IU/mL, TSH 2.9992mIU/L, FT4 15,1100pmol/L, FT23.7100pmol/L. Furthermore, the assay of cerebrospinal fluid (CSF) revealed the fluid to be colorless and transparent, with elevated levels of IgA 0.76mg/ dl (0-0.2mg/dl), IgG 8.93mg/dl (0.48-5.86mg/ dl), whereas the NMDA-R-Ab, CASPR2- Ab, AMPA1-R-Ab, AMPA2-R-Ab, LGI1-Ab, GABAB-R-Ab were all negative. A non-contrast magnetic resonance imaging (MRI) of her brain detected significant ventricle dilatation, an obviously widened sulcus as well as cortical, cerebellum and brain stem atrophy. Light-like long T2 signal shadows and high signal abnormalities on fluid attenuated inversion recovery (FLAIR) could be seen around bilateral lateral ventricles (Figure 1). DWI showed symmetry with high signals abnormalities in bilateral lenticular nucleus and caudate nucleus, as well as linear high signal abnormalities in the left frontal lobe (Figure 2). There was no evidence of infarcts or masses. The EEG demonstrated that three-phase wave was cyclical and released once per second on all leads (Figure 3). Figure 1: MRI shows significant ventricle dilatation, an obviously widened sulcus as well as cortical, cerebellum and brain stem atrophy. FLAIR shows light-like long T2 signal shadows and high signal abnormalities around the bilateral lateral ventricles. 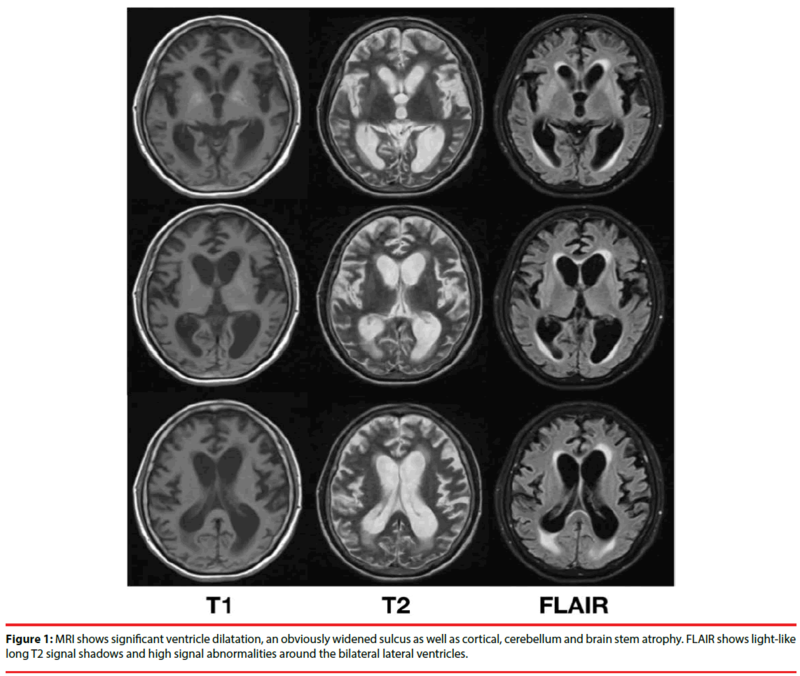 Figure 2: DWI shows symmetry with high signals abnormalities in bilateral lenticular nucleus and caudate nucleus, as well as linear high signal abnormalities in the left frontal lobe. Figure 3: EEG results demonstrate periodic three-phase waves. Pre-mortem sCJD and anti-NMDA-R encephalitis share many similar clinical features , including, but not limited to, dementia, psychosis, myoclonic seizures, and visual hallucination. In view of the above results, with the patient’s negative result of NMDAR- Ab in CSF, the diagnosis of anti-NMDA-R encephalitis could not be totally eliminated. In particular, this case only presented with common symptoms. It is challenging to differentiate between sCJD and anti-NMDA-R encephalitis by only observing those clinical symptoms. Because the course of sCJD is transmissible and invariably fatal , making an early and accurate diagnosis and differentiation between sCJD and anti-NMDA-R encephalitis are critical for the protection of patient’s families, physicians and nursing staffs against prion transmission. There have now been studies demonstrating that psychiatric symptoms can be a prominent feature in many patients suffering from sCJD and anti- NMDA-R encephalitis [3-5], which may be regarded as an early warning of these rare diseases. Not only that, recent study has revealed that the symptoms including psychosis of anti-NMDA-R encephalitis can be significantly reversed by applying first-line immunotherapy [6,7]. Hence, we informed and administered a combination immunotherapy of intravenous immunoglobulin 0.4g/kg and methylprednisolone 1000mg once per day to differentiate sCJD from anti- NMDA-R encephalitis. Five days after receiving the first-line immunotherapy, no improvement on her clinical symptoms was observed. Based on the CDC criteria for CJD (Table 1) , this case was diagnosed as probable sCJD while the patient was alive, with the key findings of unexplained dementia associated with irreversible psychosis, confusion, hypoemotivity, suspiciousness and visual hallucination after applying first-line immunotherapy for five days, as well as myoclonus, stupor state and forced gestures. 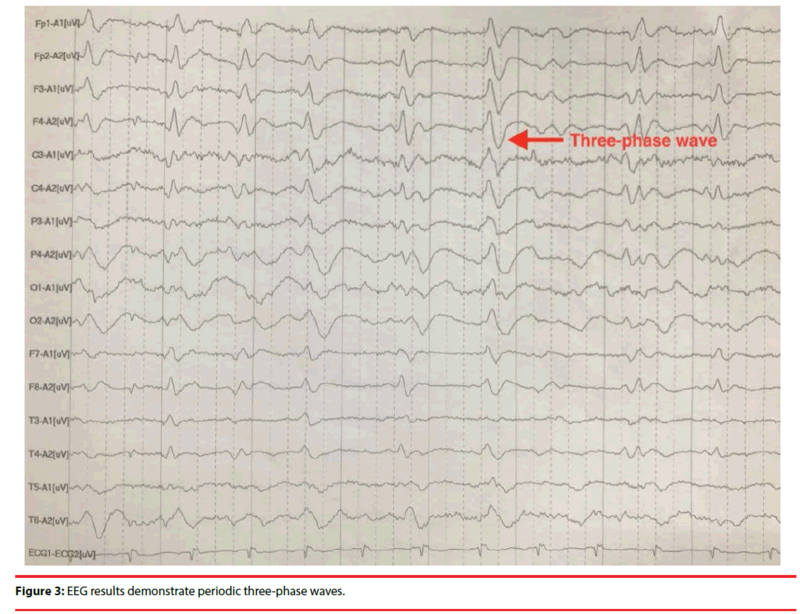 Furthermore, high signal abnormalities in bilateral lenticular nucleus and caudate nucleus on DWI (Figure 2), periodic threephase waves in EEG (Figure 3) and the negative result of NMDA-R-Ab in CSF also supported the diagnosis. Therefore, it was finally concluded that the patient’s condition was consistent with probable sCJD, and it was possible to make a differential diagnosis so that anti-NMDA-R encephalitis could be eliminated. There were no findings in this patient that would have pointed to any other alternative diagnosis. Considerable long time was spent to speak with her and her family about the course of sCJD, especially on the prognosis. She and her family selected to abandon further treatment. Table 1: CDC’S Diagnostic criteria for Creutzfeldt-Jakob Disease (CJD), 2010. One lesson emerging from this case is that the possibility of probable sCJD should be taken into consideration in the diagnosis of patients with dementia associated with persistent and worsening symptoms of psychosis, hypoemotivity, suspiciousness, stupor state and forced gestures that are irreversible after administering first-line immunotherapy for five days, and with high signal abnormalities in DWI and periodic triphasics in EEG. Physicians, especially psychiatrists should be aware that psychiatric symptoms may be important warnings of sCJD in clinic. The patient and her family members have been informed and agreed that this case and the related images can be published, and the report has been approved by the Ethics Committee of Ethical Research under The First Hospital of China Medical University. This work did not receive any specific grant from any funding agency in the public, commercial, or not-for-profit sector. None of the authors report conflicts of interest with commercial enterprises. Newman MP, Blum S, Wong RC, et al. Autoimmune encephalitis. Inter. Medic. Journal 46(1), 148-157 (2016). Ladogana A, Puopolo M, Croes EA, et al. Mortality from Creutzfeldt-Jakob disease and related disorders in Europe, Australia, and Canada. Neurology 64(1), 1586-1591 (2005). Maneta E, Garcia G. Psychiatric manifestations of anti-NMDA receptor encephalitis: neurobiological underpinnings and differential diagnostic implications. Psychosomatics 55(1), 37-44 (2014). Krasnianski A, Bohling GT, Harden M, et al. Psychiatric symptoms in patients with sporadic Creutzfeldt-Jakob disease in Germany. J. Clin. Psychiatry 76(1), 1209-1215 (2015). Rabinovici GD, Wang PN, Levin J, et al. First symptom in sporadic Creutzfeldt-Jakob disease. Neurology 66(1), 286-287 (2006). Maarten J Titulaer LM, Iñigo Gabilondo, Thaís Armangué, et al. Treatment and prognostic factors for long-term outcome in patients with anti-N-Methyl-D-Aspartate (NMDA) receptor encephalitis: a cohort study. Lancet. Neurol 12(1), 157-165 (2013). Wall CA, Rummans TA, Aksamit AJ, et al. Psychiatric manifestations of Creutzfeldt-Jakob disease: a 25-year analysis. J. Neuropsychiatry. Clin. Neurosci 17(1), 489-495 (2005). Services DoHaH. Centers for Disease Control and Prevention, CJD (Creutzfeldt-Jakob Disease, Classic) (2012).